WIP Limits or "Work-in-Progress" limits stand for the maximum amount of work items a given phase can hold. Applying "Work in progress" limits to your workflow is one of the core Kanban practices. This helps your team to minimize context switching and focus on achieving high-quality results. Using WIP limits helps your team to complete the assigned tasks faster (reduce the cycle time of tasks). It helps to manage your team's workload by keeping a steady rhythm without overloading the members. In practice, if a given "in progress" column has a WIP limit of 2 -> the user will not be able to pull more than 2 cards in that column. They have to finish one of the tasks before pulling a new one. 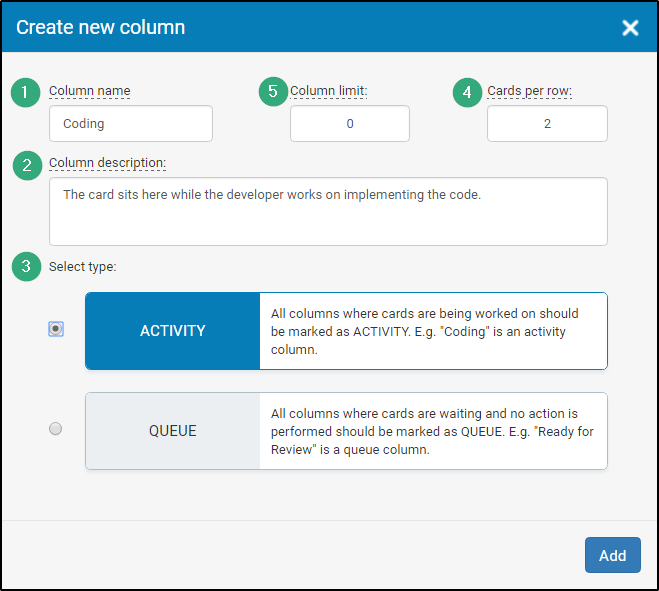 Using WIP limits also prevents the accumulation of too many cards in the Queue columns and it is a good signal that the tasks must be completed in order to free capacity for new ones. Having too much partially completed items is wasteful. 2. How to configure your limit? Allow exceeding limits – this way the limits serve only as indicators. When the limit is exceeded the column header becomes red. 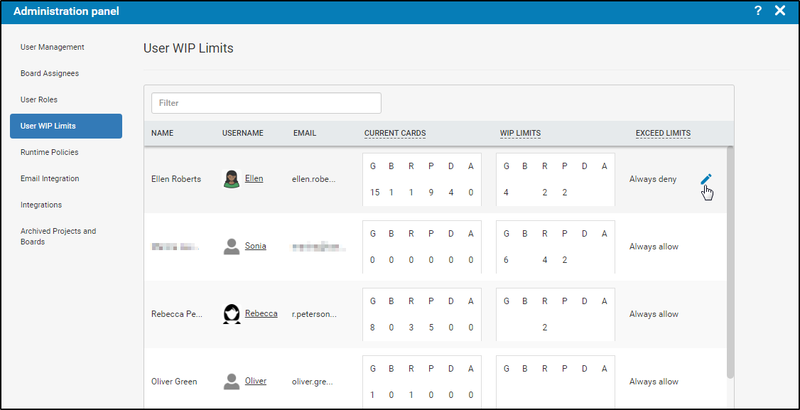 Don’t allow the limits to be exceeded – the team members will not be able to exceed the limit and the card will be automatically moved to the previous column. You can control if users are allowed or not exceeding any of the limits in your board at the top of the Edit board page. You can also configure your limits from the Workspace and Board settings -> Global board settings. 2. How to Set up WIP Limit? Open the edit mode of the board and click on the gear settings icon that belongs to every column. In the Create new column panel you can insert/edit details about the column. The limit number will be visible at the column header of the respective column in your board. The Main column "Engineering" has three sub-column. 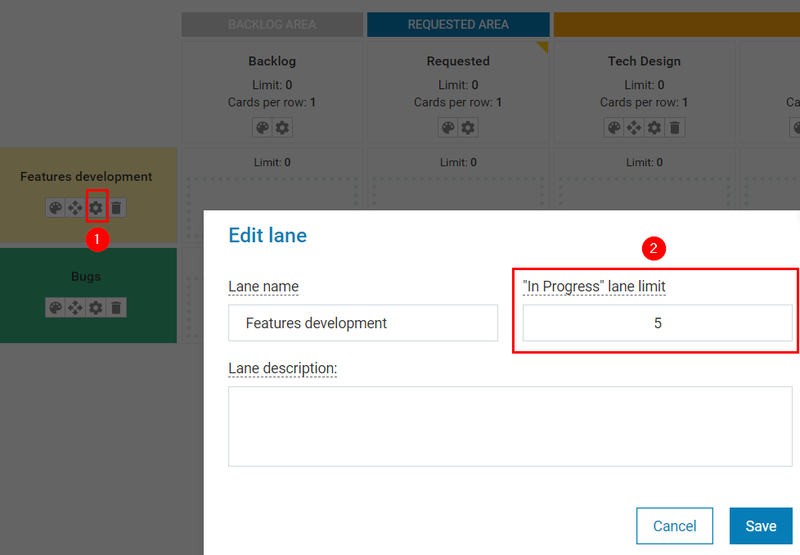 Kanbanize users are able to set up a limit for the main column only. Edit your workflow and use the gear settings icon that belongs to the main column to insert the CONWIP limit. The WIP limit will impact the three sub-columns, reminding the team members that no more than 8 cards should stay in the three columns at a time. Open the edit mode of the board and enter the cell limit in the Limit field that belongs to each cell or open the gear settings icon and input the number. -> select the gear settings icon that belongs to the lane (1) -> enter the limit number in the box (2). G - global level, B - Backlog, R - Requested, P - In Progress, D - Done, and A - Archive. The WIP Limits column displays the configured WIP limits per area. The Exceed Limits is a configuration controlling whether users can exceed WIP limit or not. To define the WIP limit per user -> hover over the Exceed Limits cell of the user for which you wish to set WIP limits - > click on the edit icon (the pencil). You can configure which sections (Backlog, Requested, In Progress, Done, Archive) should be included in the calculation of the current number of cards. You can set a global limit or a limit per section. The global limit is the maximum number of cards allowed for a person for all workspaces and boards in the account. The * sign in the global limit field means unlimited number of cards. Enter the number you wish in the field. The * sign in the section field means that the number of cards can go as high as the global limit. Enter a number in the section field if you wish to have a WIP limit for the particular section. 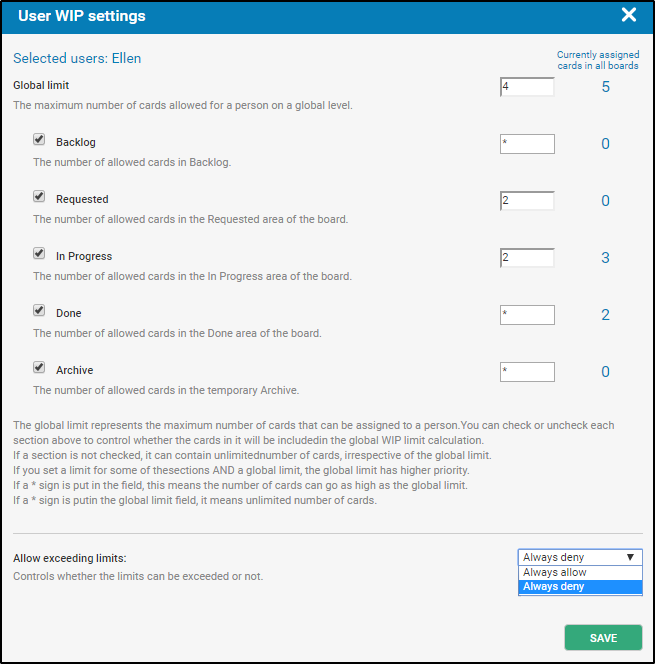 Remove the check mark to exclude the section from the WIP limit calculation and to allow it to contain an unlimited number of cards. You can define, if the limits can be exceeded or not by selecting Always deny or Always allow from the dropdown menu. If you set always deny, the system will notify you with a message that the user's WIP limit is exceeded when assigning the card to them and the card will be unassigned. If you set always allow, the system will notify you that the WIP limit is exceeded and this is an allowed but not desirable action. Click on Save to apply the user's WIP limits. How to configure your board WIP Limits?